What is Cryoskin Slimming & Toning? Cryoskin slimming treatment takes approximately 28-minutes. During this time we apply both heat and cold to the targeted area. We will focus on one area of the body at a time. Our technician applies heat at 40 C (104 F) for 2-minutes, then 12 minutes of cold at -8 C (-17.6 F). The Cryoskins dual thermal therapy causes the fat cells to drop in temperature to between 17 – 12 C (62 F – 53 F) causing them to naturally destroy and pass through the lymphatic system. The goal is to lower the temperature of the fat cells enough to cause a phenomenon of apoptosis. The maximum interval for this treatment is every 2-weeks allowing the body time for the fat cells to naturally pass through your system. Our Cryoskin Toning Treatment is 20 minutes in length – this procedure is similar to Cryoskin Slimming Treatment, but with cold therapy only. Again we will focus on one area at a time but we can perform more than one area in a session. The device will drop to -2 C (28.4 F) this causes local metabolism and microcirculation to improve in the target fat cell area. This immediately boosts and improves your body’s natural production of collagen eliminating cellulite, and toning the targeted area and thus, reducing the signs of aging. Yes, it is very safe. The specialty Cryoskin equipment is top rated, the best in the CryoTherapy Industry. The temperature control system is state-of-the-art. There are sensors on the head of the device alongside the vortex flow nozzle. The control system of the device works in real-time. If it gets too cold or you feel uncomfortable, we can and will shut it down manually immediately, so you have a double safeguard – the system’s sensors and automatic shut off, plus our technician is in control at all times. How does Cryoskin Toning and Cryoskin Slimming Treatment Feel? The treatment is painless. Some of our clients have described it as rather a pleasant sensation as it is a massage based application technique. Also because we are warming the skin at the start of the session and then gradually decrease the temperature on the targeted area. Are There Any Restrictions For Cryoskin Treatment? What are the Differences Between Cryoskin Therapy and Other Cryo Treatments? There are other manual cryotherapy machines which work great for their intended purposes – improving circulation, removing pain, muscle soreness, and reducing inflammation – the list of cryotherapy treatment benefits is well-documented. Cryoskin is a specialty treatment for the elimination of fat cells. 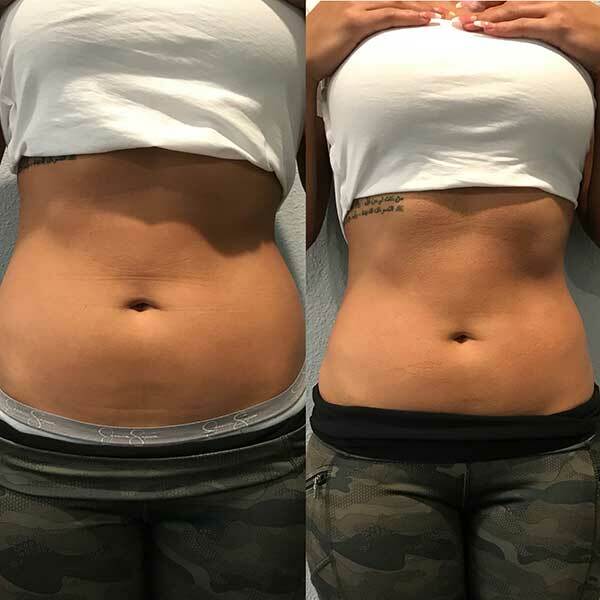 After tests and experience, the results from Cryoskin Therapy on fat cells can’t be beaten. CyroSkin garners these results because our device produces both hot and cold in rapid succession. The swift and dramatic change of temperature has a debilitating effect on the body’s fat cells causing them severe damage or complete membrane collapse (death). The waste is then collected and ultimately passes through the lymphatic system. Why is Cryoskin Slimming Treatment Only Allowed Every 2-Weeks? The natural destruction of fat cells will cause cell waste. This waste is passed through the body naturally, first through the blood then the lymphatic system and then urine. This process on average takes about 2 weeks. What Are the Side Effects from Cyroskin Slimming or Cryoskin Toning Treatments? Generally speaking, there are no adverse side effects. You may notice a slight increase in the amount you urinate over the next 3-days following treatment, most people don’t notice. You may notice a different color tint of your urine, this is normal. In some cases localized redness has been noticed, that disappeared after a few hours and in rare cases there was local pain, not exceeding 2 to 3 hours. Depending on the skin products you use, you might notice some itching – you can avoid this easily by not applying any cosmetic products prior to treatment. There have been some experiences of delayed onset muscle soreness from treatments on the stomach due to unintentionally engaging the abdominals, which disappear later that same evening. Who are good candidates for Cryoskin Toning and Cryoskin Slimming? Anyone who has stubborn areas of fat they are looking to reduce will enjoy the results. Can I Do Anything To Enhance My Cryoskin Toning and Cryoskin Slimming Treatments? Yes, implementing a healthy lifestyle, and a good diet and exercise program will enhance and the new slimmer and toner you. How Long Do the Cryoskin Toning and Cryoskin Slimming Treatment Results Last? The longevity of your results from our sessions depend on your lifestyle and your diet. With that said, the results can last for several months or for several years. It is advisable to come back in for 2 or 3 sessions 6 months after the end of treatment to maintain results. Some form of exercise 3-times per week to every day sure helps you keep the results. How Long After Treatment Will I See The Cryoskin Slimming and Cryoskin Toning Results? The first results are generally visible from the first session and often very encouraging. However, it should be noted that the best results appear from 15-days to 3-weeks after the start of treatment and extend for several months after the end of treatment, as your body reconfigures itself and discharges those old fat cells as waste. 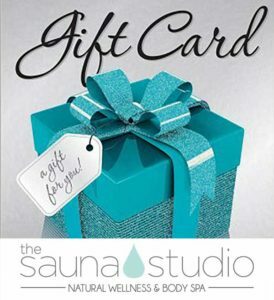 Gift Certificate – Click below and shop! Click here to see our monthly specials! Sign up here to receive our e-newsletter! ©2014-2017 The Sauna Studio - All Rights Reserved.